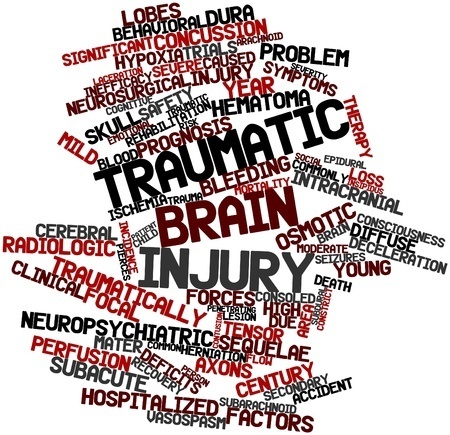 WHAT: An overview of information on Traumatic Brain Injuries. TBI is a complex injury and includes a large spectrum of symptoms and disabilities. TBIs can be present from initial onset or delayed. Even a mild TBI, such as a concussion, can become a significant problem if not diagnosed. Multiple undiagnosed, untreated, mild TBI concussions can lead to a moderate to severe TBI over time. TBI presents itself in a variety of ways and generally leads to secondary diagnoses. Those secondary diagnoses are dependent on the area of the brain that the injury occurred in. Specific symptoms are caused by injuries to distinct areas of the brain. Injury to the frontal lobes will cause loss of higher cognitive functions and can result in secondary diagnoses such as aphasia (inability to speak or recall words) and loss of inhibitions leading to inappropriate social behavior. Injury to the cerebellum can lead to loss of coordination and balance. A brainstem injury can affect the autonomic nervous system’s ability to control things like breathing and heartrate. HOW: TBIs can happen to anyone, there are no genetic risk factors. They most commonly occur in car accidents, falls and sports injuries. TBIs must be diagnosed by a medical professional, who can utilize a variety of scales (Glasgow, Ranchos Los Amigos, etc.) to determine the severity of the injury. The medical professional will categorize a TBI in three different ways: mild, moderate or severe.